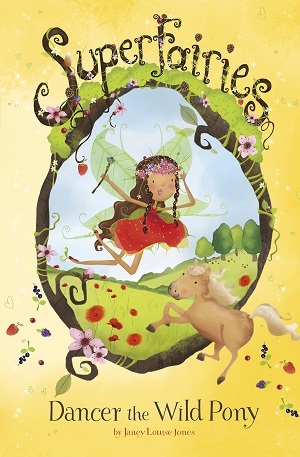 This week an exciting new series, Superfairies, is published by the author of Princess Poppy – Janey Louise Jones.The books feature a team of superfairies who use their skills and magic to save animals in trouble. 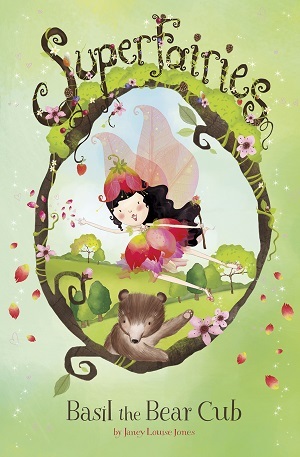 Each book has full-colour illustrations by Jennie Poh, a neat story divided into easy chapters, the fairy song and a small interactive quiz about the fairies. The books are delightful – like little collectors’ items, and full of the beauty of nature. I’m delighted to have Janey Louise Jones guest blog for me today about her favourite wildflowers – a huge part of the landscape of the Superfairies. Whilst writing my new series, Superfairies, for girls from 6-8 years, I’ve been reflecting on my lifelong love of nature, woodlands and the delicate wildflowers which grow in woods, hedgerows and meadows. All of this fires my imagination and informs all my stories, and is linked to my passion for fairies! And it’s a passion which began at the age of my readers. The Superfairies get their powers from their respect for nature, and they wear floral head-dresses and gowns inspired by flowers. The colour palette of the flowers in the natural world informs all my thoughts about colour and delicacy in general. What could be more perfectly designed than an exquisite flower head, skirted with dainty, silky petals, as sheer as gossamer – how perfect as a dress for a fairy! I am not the first to feel this way about wildflowers and I’m sure I won’t be the last. As a child, I fell in love with Cicely Mary Barker’s Flower Fairies, collecting the books and china plates. Yes, they are idealised, dreamy, maybe even ‘chocolate box’, but they are much more wholesome and enchanting than many of the garish images fed to children these days. For me, flowers which grow wild in meadows and tangled through the hedgerows of country lanes, peeking out like sparkling rubies, amethysts and sapphires, are more beautiful than perfect glasshouse blooms forced on for the commercial market. When I was a child, a great friend once told me that she didn’t believe flowers should be cut, that it was like killing them, and although I do love vases of flowers indoors, it seems more natural and correct that they should grow in the wild, wherever they please, in ill-disciplined, rebellious gaggles. I would never dream of plucking a wildflower from its roots, and indeed they do not survive for long if one does. I also think that the names of wildflowers make the prettiest names for girls and have populated my stories with characters named, Poppy, Daisy, Marigold, Lavender and Sweetpea. I have always had a love affair with wild, red poppies. A simple, herbaceous flower, I think they are bold, powerful, simple, emotive and divine. Perhaps the paintings by impressionist painters such as Claude Monet first caught my eye as a child, as well as fields of poppies in my local area of East Lothian. I based my first series of books on a character named ‘Poppy’, and in fact, for many years in my childhood, insisted on being called Poppy. It’s still my favourite girls’ name – but I have three sons! These flowers spend most of the year underground as bulbs and emerge from April onwards. I love the way they dance and nod in the spring after the colourless, barren months of winter. I would never pick a bluebell – they look just right beneath trees and along riverbanks, and furthermore, they are a protected species! Over half of the world’s bluebells are in the UK. Sometimes they can looks like a hypnotic haze of purple-blue mist – too beautiful for words. Like many little girls, I adored making a daisy chain, considering it one of the skills I must achieve, along with telling the time, tying shoe laces and baking cakes. Daisies represent purity and innocence, and I find there is something unspoilt about their humble simplicity. What can be a better marker of summer, than daisies on the lawn? As for the name, many people think it comes from ‘day’s eye. Now, Daisy is another girl’s name that I adore! Bright blue cornflowers are so cheerful and pretty. They got their name from growing in fields of corn (as well as barley, oats, wheat and rye.) I first noticed them when my father started to grow them in our garden. He was interested in attracting butterflies and bumblebees. It’s a pity that so many gardens now are mainly paved with some tubs and shrubs, because these kinds of wildflowers definitely do attract bumblebees and butterflies. I am also passionate about bees and ladybirds…but that’s a whole other topic! Sometimes I look at flowers which are so cool and trendy, and available all year round, and hardly look like flowers at all, and I think, I’d rather have wildflowers – even if it is just for a few precious weeks of the year. Everything should have its season – its time in the sun. You can buy Superfairies: Dancer the Wild Pony here, and Superfairies: Basil the Bear Cub here.